Dundonald and Bo’ness met again on Football Nation EoS Cup duty only two weeks after their 3-3 draw in the league. Both teams were piped onto the pitch and observed a minutes silence for Rememberance Day. The visitors took the lead in the third minute when Prentice headed home from a corner. Dundonald could have levelled instantly when Smith’s knock down put McKenzie in but the midfielder’s shot hit the post. The home side were in danger of falling futher behind but Dunlop cleared off his own line to prevent a certain goal. It was all Bo’ness at this point and they should have increased their lead when a ball in from the right found their player unmarked inside the box but with the goal open he blasted the ball over the bar. A quick break gave the visitors another great chance to score but again with the goal at their mercy they put it wide. The last chance of the half fell to Dundonald when young midfielder Billy Rogerson did well to create some space but his shot, from the edge of the box, went wide. Dundonald started the second half knowing they were lucky to still be in this match . 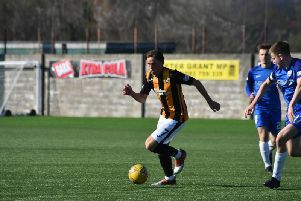 Campbell had an early chance when he forced the Bo’ness keeper to tip his free-kick over the bar but then it was the visitors who were then on the front foot again and Dundonald keeper James Lennox was forced to make three fine saves to keep his team in the game one being from a penalty. Dundonald best chance of the match came when a ball into the box found Smith in space but his shot was cleared off the line. Dundonald tumbled out of their final cup competition but they can have no complaints because Bo’ness were the fitter, hungrier team and should have won by more. Dundonald: Lennox, Durie, Wedderburn, Dunlop, Drummond, Walton, Wallace, McKenzie, Rogerson, Smith, Campbell. Subs: Forbes, Penman, Sibanda, Ross. This Saturday, Bluebell travel to Sauchie for a Conference B match.